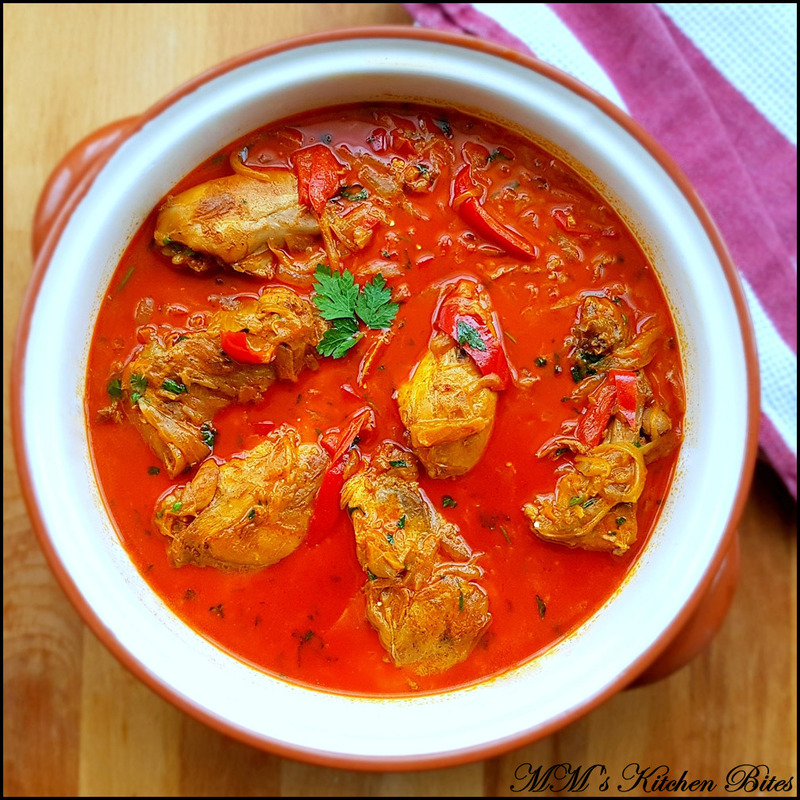 Home chicken Hungarian Chicken Paprikash…colour my life!! Pour the required amount of sour cream in a bowl and leave it on the kitchen counter to get to room temperature before you start cooking. Get the chicken to room temperature and pat dry with paper towels. Salt and pepper all sides of the chicken pieces. Heat about 1 tbsp of oil in a large heavy bottom pan/skillet or Dutch oven. Once the oil is hot, place the chicken in the pan skin side down and fry over medium high heat in batches until golden brown – around 4 minutes each side. Remove and keep aside. Reduce the heat to medium low. Add salt, pepper and paprika and fry, stirring constantly until the paprika is very fragrant, about 30 seconds. Be careful as paprika can burn easily and become bitter. Add the peppers and tomatoes to the pan and cook for a couple of minutes. Pour in the chicken stock and scrape up any browned bits at the bottom of the pan. Add in the bayleaf. If using chicken with skin, return the fried chicken to the pan (skin side up), along with any juices that have accumulated on the plate. Bring to a boil and then reduce the heat to a simmer. Cover and cook, stirring occasionally, until the chicken is cooked through and falling off the bone – about 50 minutes. Once the chicken is cooked, temper the sour cream by whisking one spoon at a time of hot liquid from the chicken to the bowl of sour cream. (This will raise the temperature of the sour cream gently and it won’t curdle when added to the hot chicken.) Once tempered, pour the sour cream mixture into the pot and stir to combine. 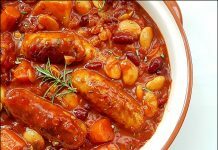 Cook on low heat for about 5 minutes – don’t let it boil after sour cream has been added. Serve with noodles, potatoes, pasta or rice. This is typically made with bone in and skin on chicken pieces. I have personally never liked the look or the taste of skin on chicken in a slow cooked “curry” and hence always use skinless chicken pieces. Bone in or boneless depends on what I have available at home but as always I never use boneless chicken breast for anything which even remotely looks like a “curry”. To avoid confusion in the way I have written the recipe – reinstating – chicken with skin on needs to be fried golden crisp and then added to cooked onion mix whereas skinless chicken gets added in only after frying the onions. You can of course choose to do your own thing but IMO, the above method results in juicier chicken pieces. With the amount of onions I use (almost double the amount of most other recipes), I have never felt the need to the add flour to thicken the sauce. 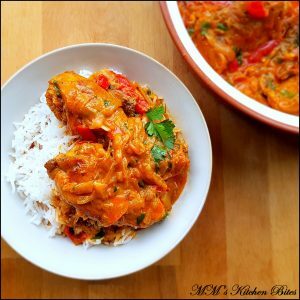 If you want to try adding flour, you can either coat the chicken pieces with flour before frying or add in about a tablespoon of flour once the onions are soft or whisk in about a tablespoon of flour to the sour cream before tempering it. 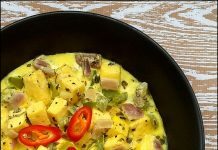 Previous articleMexican style Scrambled Eggs…Mein Bhi Nigella!!! 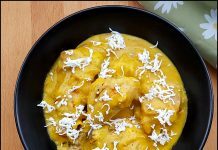 Next articleSpanish Chicken in Almond Sauce (Pollo En Salsa De Almendras)…or Chicken Fricassee in Almond Sauce (Pollo En Pepitoria)? ?